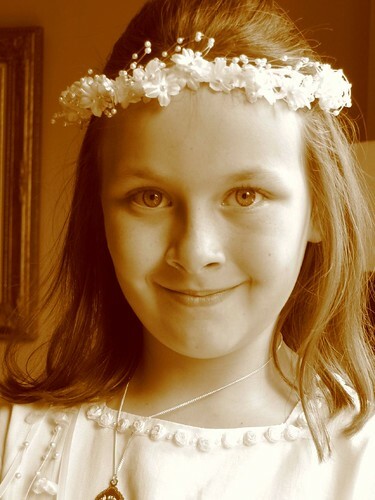 Michael has posted an exquisite series of photos at his Flickr area, celebrating Lily’s first Communion – she’s growing so fast! It seems like ages since we saw her. which struck me as an impressively nuanced way of making the theological point that divine truth can be known (albeit perhaps obscurely) apart from committed faith – especially impressive since Hewlett managed to say it in rhymed lyric. Next time I’m in charge of a liturgy, I’ll try to work that one in.